The Energy Information Administration says renewables will, by 2050, still only meet 7% of U.S. energy needs despite the hype and Green New Deal fantasies. The Energy Information Administration (EIA) just released its Annual Energy Outlook (AEO) 2019, which shows renewables garnering an increasing share of the electricity generation market through 2050, but only contributing a small amount to total primary energy supply. In fact, solar and wind only supply 7 percent of total primary energy needs in 2050—up from 3 percent today—despite providing 23 percent of electric generation in 2050 compared to 8 percent today. The AEO 2019 projects total renewables (solar, wind, hydroelectric, geothermal, and biomass) to be 31 percent of generation by 2050. As a result, fossil fuels still supply 78 percent of U.S. energy needs in 2050—down from 80 percent today. The Outlook clearly indicates that the Green New Deal is not feasible without major policy changes, for it requires 100-percent renewables in the generating sector in just 10 years. The last election and follow-up polls show that most Americans do not want to pay much to reduce greenhouse gas emissions. The polls show them wanting to do something, until they find out they have to pay for it and change their lifestyle. Carbon dioxide emissions are forecast to decline through 2040 and be 4 percent lower in 2050 than their expected 2018 level. The United States is expected to become a net energy exporter by 2020 and to remain so throughout the projection period as a result of large increases in crude oil, natural gas, and natural gas plant liquids production coupled with slow growth in U.S. energy consumption. Crude oil production remains greater than 14.0 million barrels per day through 2040 and remains higher than expected 2018 levels through 2050. Dry natural gas production reaches 43.4 trillion cubic feet by 2050—almost double its 2018 expected level. Liquefied natural gas (LNG) exports increase until 2030 and then flatten through 2050. After LNG export facilities currently under construction are completed by 2022, U.S. LNG export capacity continues to increase. After 2030, however, U.S. LNG is no longer as competitive in EIA’s forecast because additional suppliers enter the global LNG market, reducing LNG prices and making additional U.S. LNG export capacity uneconomic. EIA projects that natural gas and renewable energy will be the major sources of future electricity generation. The natural gas share of generation increases from 34 percent in 2018 to 39 percent in 2050, and the renewables share increases from 18 percent in 2018 to 31 percent in 2050. Coal’s share of electricity generation is expected to decline from 28 percent in 2018 to 17 percent by 2050, and nuclear power’s share is expected to decline from 19 percent in 2018 to 12 percent in 2050. 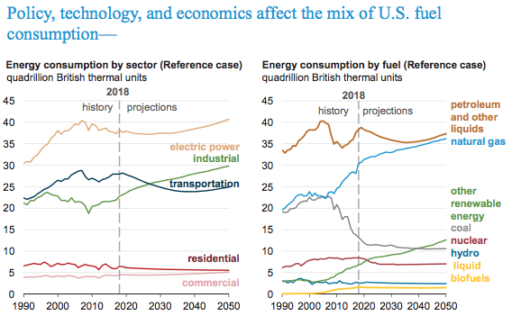 Increasing energy efficiency across end-use sectors slows U.S. energy consumption growth, even as the U.S. economy continues to expand with GDP growing by almost 2 percent annually between 2018 and 2050. The transportation sector is the largest consumer of petroleum and other liquids, particularly motor gasoline and distillate fuel oil. Fuel economy standards increase for light-duty vehicles through 2025 and for heavy-duty vehicles through 2027, but travel continues to increase, increasing consumption of petroleum and other liquids later in the projection period. Sustained low natural gas prices and the EIA assumption of declining costs of renewable power enable the shares of electricity generated by natural gas and renewables to increase as depicted in the graph below with solar generation overtaking wind generation by 2035. The continuing decline in natural gas prices and increasing penetration of renewable electricity generation result in lower wholesale electricity prices, changes in utilization rates, and operating losses for a large number of baseload coal and nuclear generators in EIA’s forecasts. Assumptions of declining costs and improving performance make wind and solar increasingly competitive compared with other renewable resources in AEO 2019, despite their intermittent nature. Most of the wind generation increase is expected to occur in the near term, when new projects enter service ahead of the expiration of the federal Production Tax Credit. Solar generation growth continues beyond the phase down of the solar Investment Tax Credit after 2024 because EIA assumes the costs for solar continue to fall faster than for other sources. U.S. crude oil production continues to set annual records through 2027 and remains greater than 14.0 million barrels per day through 2040—3.3 million barrels per day above 2018 expected levels. Lower 48 onshore tight oil development continues to be the main source of growth in total U.S. crude oil production. The continued development of tight oil and shale gas resources, particularly those in the East and Southwest regions, also supports growth in natural gas plant liquids production, which reaches 6.0 million barrels per day by 2029, and dry natural gas production, which reaches 43.4 trillion cubic feet by 2050. Growth in drilling in the Southwest region also drives natural gas production from tight oil formations. The percentage of dry natural gas production from oil formations is expected to increase from 8 percent in 2013 to 17 percent in 2018 and to remain near this percentage through 2050. Growth in drilling in the Southwest region, particularly in the Wolfcamp formation in the Permian basin, is the main driver for natural gas production growth from tight oil formations. The increase in natural gas production from oil-directed drilling also puts downward pressure on natural gas prices throughout the projection period, which enables the natural gas share of the generation market to continue to grow. EIA is still forecasting a fossil energy future for the United States with fossil fuels supplying 78 percent of U.S. energy needs in 2050. While EIA assumptions support increased generation from intermittent wind and solar resources, they only provide 7 percent of total U.S. energy supply in 2050—slightly more than double today’s share. Petroleum still remains the dominant U.S. fuel sparked by increased driving in transportation sector, followed by natural gas, which increases its share of the electric generation market. This forecast reflects the growing evidence that the United States has become a global energy superpower, and will be so for many years into the future. Americans who have spent decades worrying about energy insecurity now have only to worry about whether anti-energy government policies will cloud that future.